The minute I see pomegranates in stores, I know that fall is really settling in. Pomegranates have reached super stature and have been dubbed the new super fruit, surpassing blueberries as the antioxidant of choice for heart health. So I buy a lot of them and use them in a variety of ways. But it is an art to crack into them and extract those jewel like tart seeds that are held ever so tightly in their own individual membrane sacs. The seeds, called arils, are full of vitamin C and potassium. The easiest way to cut into a pomegranate is to cut off the peel near the blossom end. Then score the pomegranate from end to end with a sharp knife into four sections. Submerge the sections in a large bowl of water and extract the seeds with your fingers. The seeds will fall to the bottom of the bowl and the white pith will float. Discard the pith and drain the water from the seeds. Now you are ready to use them. I like pomegranates straight up so I cut them in half and use my juicer to extract as much juice as possible. Tart and a bit astringent, the juice will get you going in the morning. Warning, though, pomegranate juice does stain counters and clothes so I place a towel over the fruit as I juice it. Pomegranates have a long counter and refrigerator shelf life. Keep them a week on a counter and up to three weeks in the refrigerator. You can also freeze the seeds, but they will be a little soft when defrosted so they will only be good used in cooking, not in salads or as garnishes. Use the seeds as a garnish for creamy squash soups. Sprinkle the seeds on hot cereal such as oatmeal. Fill a decorative bowl with pomegranates and use as a centerpiece for the holidays. Using a sharp knife cut off the crown of one pomegranate about 1/2 inch from the top. Slice the sections through the white membrane. (Do this part in a bowl of water to avoid staining your clothes or cooking surface). Use your fingers to separate the seeds in the water. The white honeycomb looking membrane will float to the top as the seeds (aka arils) will sink to the bottom of the bowl. Strain the seeds removing any remaining membrane pieces and set side. 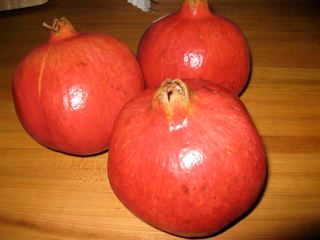 Cut the remaining pomegranates in half and juice them; you will need 3/4 cup for the recipe. Strain the juice and set aside. Heat the olive oil in an ovenproof skillet to just below the smoking point. Add the pork and sear it quickly on all sides. Transfer the skillet to the oven and cook until a meat thermometer inserted into the thickest part of the meat registers between 155F and 165F, depending on how you like it cooked. This should only take about 7 to 10 minutes. Transfer the meat to a cutting board and cover loosely with foil while the sauce is prepared. Heat the jam with the pomegranate juice until a smooth sauce is obtained and cook the mixture over low heat for about 4 minutes. Stir in the pomegranate seeds and keep the sauce warm and covered. Cut the pork on the diagonal into medallions about 1-inch thick. Place on a serving platter. Spoon some of the sauce over top to serve. Pass additional sauce on the side. Recipe from Ciao Italia Family Classics, published Oct 25, 2011, by Mary Ann Esposito. St Martins Press, NY. Like so many other viewers, I grew up in an Italian- American family, very close (emotionally and geographically) to my grandparents. Your story in Nella Cucina about your grandmother, pomegranates, and Christmas makes me remember all of the good, harworking Italian and Italian- American souls with whom I was acquainted as a child. I get misty every time! I love the information you gave about how to cut a pomegranate and clean the seeds. These are really tart but tasty and healthy!!!! !